The Inn was built in the 17th Century and was recently acquired and is run by the Harvey family. Portmellon Cove was home to Percy Mitchell, a well known boatbuilder who established a boat yard in the 1930's. The cove is fully tidal and has a dog-friendly beach. More information about Portmellon and the surrounding area is available on portmellon.net . A few photos of the pub and cove are provided below, please see our facebook page for more photos and news. Whether you are looking for somewhere to stop off for lunch on a day trip, looking for a beach or plan to stay with us, we are located in an area with lots to see and do. Below are just a selection of local attractions. 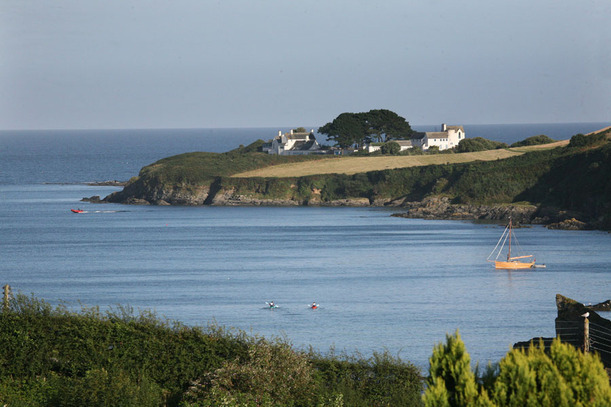 Our friends at Cornwall Kayaking can arrange kayak training, trips and equipment hire from Portmellon Cove. The historic and picturesque fishing port of Mevagissey is located about 5 miles south of St Austell. It was named after two Irish saints, St Meva and St Issey (or Ida, the "g" comes from hag, the Cornish word for "and"). The harbour was originally built in 1774, at that time the main sources of income for the village were pilchard fishing and smuggling, but is now home to around 65 fishing vessels. Mevagissey has a museum, aquarium and model railway. Many of the fishermen provide boat trips in summer and some can to chartered to for wreck, shark and deep sea fishing. The Fowey to Mevagissey Ferry to leaves every couple of hours at peak season (foot passengers, dogs welcome). There are many shops, galleries and places to eat and drink. Portmellon is a 10-minute stroll from Mevagissey along the coastal road. The award winning Lost Gardens of Heligan , asleep for more than seventy years, are the scene of the largest garden restoration project in Europe. In the spring of 1991, the Gardens of Heligan lay under a blanket of bramble, ivy, rampant laurel and fallen timber. A year later, the restoration team opened the gardens to enable the public to share in the excitement of their discovery. In the northern gardens are two and a half miles of footpaths, an Elizabethan mount, rockeries, summer houses, a crystal grotto, an Italian garden, a fine set of bee-boles, a wishing well and a superb collection of walled gardens. Remarkably much of the original plant collection has survived, sometimes to record sizes. To the south lies 'Lost Valley' and 'The Jungle', a sub-tropical valley overlooking Mevagissey, and overflowing with palms, tree ferns, bamboos, gunnera and numerous exotic trees and shrubs. From Portmellon, Heligan is 10-minute drive or lovely 1-hour walk or cycle ride through Mevagissey and the Heligan valley. A popular Lobbs Farm Shop is also located at Heligan. The Eden Project is an exciting, truely world-class attraction which boasts; the world's largest rainforest in captivity with steamy jungles and waterfalls; cutting-edge architecture and buildings; stunning garden displays all year round; world-class sculpture and art; evening gigs, concerts and an ice rink in the winter; educational centre and demonstrations to inspire all ages; local, fairly traded food in the restaurants and cafes; a rainforest lookout that takes you above the treetops; living example of regeneration and sustainable living; and a free land train pulled by a tractor. The Eden Project is a great day out and under a 30-minute drive from Portmellon. It is difficult not to be inspired when you visit the Caerhays Estate . The natural beauty, the architectural surprises, the inescapable sense of history and the range of activities and facilities that the estate offer, all set the scene for a wonderful day of discovery. Caerhays has an international reputation for its camellias and rhododendrons and is home to a National Magnolia Collection. The castle itself was designed by John Nash around 200 years ago and both the building and its occupants have played significant roles in the history of Cornwall. You can visit the castle and gardens, walk in the grounds and visit the stunning beaches which make up the estate. Caerhays is a 15-minute drive from Portmellon. Aside from it's own lovely dog-friendly family beach, the area around Portmellon on the south coast, has some of the best beaches in Cornwall, whether you want to find one that is quiet and off-the-beaten-track such as Colona, Hemmick and Vault, or a family focussed beach with kayak hire and family facilities such as Gorran Haven, Porthpean or Pentewan. All these beaches and more are only a few minutes drive away or a walk along the coastal path. The north coast is easily accessible well within an hour by car with busy resort beaches such as Perranporth, Newquay, Polzeath near Padstow. The north coast beaches usually have larger waves for surfing and bodyboarding and are usually much busier in the summer. Portmellon is right on the coastal path and walkers undertaking the whole or part of the route often stay overnight at the Rising Sun Inn. There is much to see along the coastal path, such as Chapel Point which can be seen from Portmellon. Chapel Point and Portmellon and some of the villages, churches and beaches in the area were recently used as locations for the 2013 Richard Curtis movie About Time . The southern coastal path heading westward towards the Roseland Peninsula and St. Mawes is one of the most beautiful and unspoilt sections of the South West Coastal Path, with many hidden valleys and beaches. Truro is a 40-minute drive from Portmellon. Explore Cornwall’s capital and only city, wander through the cobbled streets and opes to discover independent retailers but also national chains. Truro also has two indoor markets, Lemon Street Market and the Pannier Market open 6 days a week as well as Farmers Markets every Wednesday and Saturday. River trips run from Truro to Falmouth and to Trelissick Gardens , with its elaborate gardens, wide open spaces and fantastic views of the Carrick Roads which are a photographers delight. Truro Cathedral dominates the skyline and plays an important part in the City's story. It hosts lunchtime recitals, evening concerts and plays. The Victoria Gardens are near the City centre and provide a haven of peace among the award winning floral displays - a lovely setting for an alfresco lunch, popular with locals and visitors. St Austell is the nearest town to Portmellon & Mevagissey, within 15-minutes by car. Although not as quite as picturesque as Truro, St Austell has recently been redeveloped and has shops and supermarkets and a new WTW Cinema (ideal for rainy days) with a Frankie & Benny's next to it. The Wheal Martyn china clay mining museum is very interesting if you were wondering what those white mountains are on the way to Portmellon. Your can also take a tour and sample some beers at the St Austell Brewery in the town. Charlestown, next to St Austell is as a lovely small fishing village with a dock and the home of some 18th century tall ships. The ships and dock at Charlestown have often featured in Hollywood movies and television programmes. Here is a list of all the short tourist videos on this website that show the area and visitor attractions.